Wait, What? Andrew McCabe Launched an FBI Investigation Into Attorney General Sessions Because Dems Asked Him To? It's been less than a week since former FBI Deputy Director Andrew McCabe was fired by Attorney General Jeff Sessions after a recommendation for termination from the Inspector General and Office of Professional Responsibility. The drama surrounding the lawful and justified firing hasn't stopped since and late Wednesday night, ABC News dropped a bombshell story alleging Sessions was under FBI investigation last year for perjury. The man leading the charge? 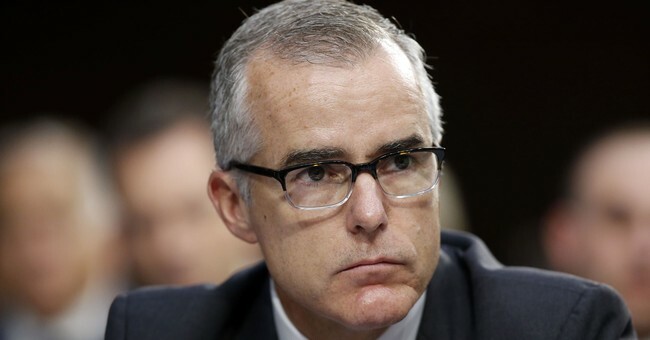 Andrew McCabe. According to the report, the investigation came after Democrat Senators requested the FBI look into contacts Sessions had with the Russians during the course of the 2016 presidential campaign and the White House transition between November 2016 and January 2017. As Mollie Hemingway notes over at The Federalist, this story was likely leaked to ABC by team McCabe or McCabe himself in an effort to undermine Sessions in the wake of his firing. That strategy is backfiring and instead bolsters accusations the FBI is highly politicized and allowing Democrat Senators, with whom they agree, to drive criminal investigations.